From the earliest times of human civilization, people have lived in the shadows of volcanoes. Although in the past two thousand years a million or more lives may have been taken by volcanic activity, people continue to live in the laps of these fiery peaks. One reason is that many volcanoes are found on islands where land is at a premium, and another is that certain ejecta from them make excellent soil for crops to grow in. Volcanic eruptions are divided into two main types: "Explosive" and "Quiet." 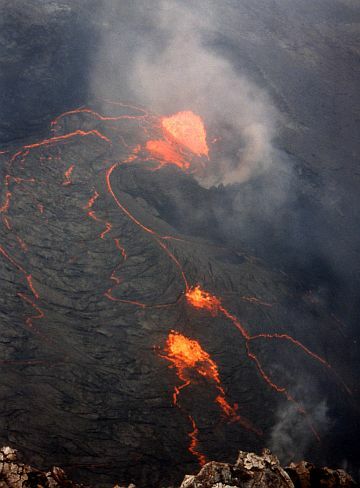 The "explosive" type usually forms the classic symmetrical cone created by the piling up of solid material, ejected through a central vent at the very top, while "quiet" eruptions usually form a low-angle cone (if one at all) and large lava fields, such as Kilauea in Hawaii. However, there is a wide variety of behavior in each of these types. The eruptions of some explosive cones are relatively mild, such as Paricutin in Mexico (see Volcanic Mountains), but others live up to their names with a vengeance. They literally explode with blasts far exceeding that of a nuclear bomb! 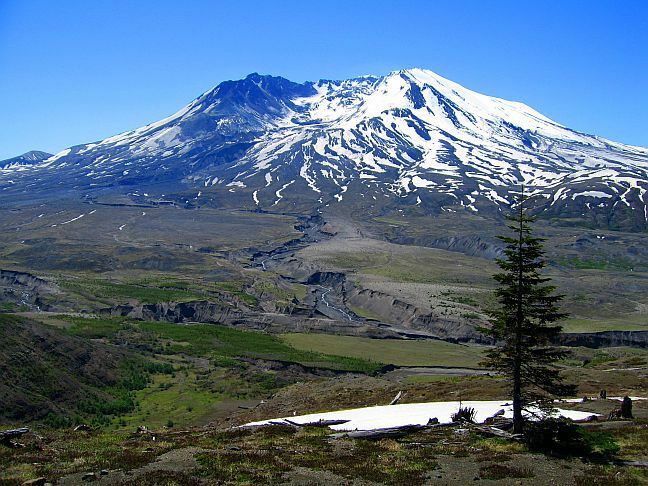 A prime example was the May 18, 1980 eruption of Mount St. Helens in Washington State. On this day a 5.1 magnitude earthquake triggered the massive collapse of the north face. This uncorked an enormous amount of energy that had been causing the mountain to bulge. The results were beyond belief. For more than nine hours, a plume of ash erupted from the volcano reaching altitudes of 16 miles! A large-scale pyroclastic flow (which is usually caused by the collapse of an eruption plume flowing down the mountain slopes at great speed) flattened trees and buildings over an area of 230 square miles. Huge lahars (which are mud flows caused by the quick melting of snow and ice as a result of the volcanic activity, mixed with water released during the eruption) traveled up to 17 miles away, destroying everything in their paths, and transported 3.9 million cubic yards of material into the Columbia River. When the eruption finally ceased days later, the mountain was 1,300 feet (396 m.) shorter and had left a crater 2 miles wide and 1/2 mile deep. Fifty-seven people were killed, and an estimated 7,000 large game animals and millions of fish perished as well. A single mud flow a couple of years later, on March 19, 1982, was so intense that it washed out a miniature Grand Canyon, 140 feet (43 m.) deep and up to 1,000 feet wide (305 m.), on the north fork of the Toutle River! 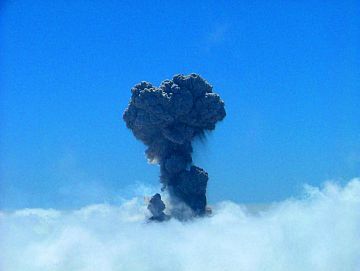 The quiet type of eruption is perhaps better understood, since its activities are more gentle, and therefore can be more closely studied than the explosive type. A great example of this type, other than Kilauea mentioned earlier, is Mauna Loa also in Hawaii. Great emissions of lava rising up through long fissures in the ground gradually built up the wide, gently sloping and extremely thick "shields" of this great mountain. Thus we get the name "shield volcanoes." Mauna Loa is a huge pile of lava 70 miles long, and has an estimated volume of about 18,000 cubic miles, making it the largest volcano on earth in area and in volume! Volcanoes are rare deep in the interiors of continents. Instead they mostly run in curving arcs that stretch along the edges of continents, along deep ocean trenches, major fractures of the earth's crusts, and along the great island chains. Most of the active volcanoes on Earth lie within a belt called the "ring of fire," which circles around the Pacific Ocean. The southern-most part of this belt is Mount Erebus in Antarctica. From there it extends up the west coast of South America, along the Andes, taking in Cotopaxi, the highest of all active volcanoes. Then it extends up into the Caribbean Islands. From here it crosses over into Mexico, taking in peaks such as Paricutin. Continuing up the Pacific Coast, it passes through such peaks as Mount Shasta in California, Mount Hood in Oregon and Mount Baker in Washington. In Alaska the line follows the Aleutian Islands, passing Katmai, where a huge eruption in 1912 blanketed Kodiak Island, a hundred miles away, under as much as a foot of ash! Across to Russia the line runs down the Kamchatka Peninsula, one of the earth's most active volcanic regions, on over into Japan, passing Mount Fuji, and then into the Philippines. The Pacific ring continues southward through New Guinea, the Solomon Islands, and into New Zealand. Ok, I need to take a breather here! ............ Ok, I'm back! So, where was I? Oh, yeah, I remember now! From Indonesia it extends across to the Caucasus and the Mediterranean, where you'll find the infamous Mount Vesuvius, Mount Etna, and the sleeping giant Vulcan, from which we get the name "volcano." More volcanic cones border the Red Sea and Africa's Great Rift Valley, including the great Kilimanjaro. Regardless of the style of volcano or eruption, magma is the underlying cause of their existence. Magma is a reddish-orange paste of rock that may have the consistency of molasses or be very thin like soup. The super-heated magma is 1,800° to 2,200° F. and rises to the surface through pipe-like tunnels called vents, or through long cracks in the rock that extend down through the Earth's crust. One unique danger (among many) produced by magma is the volcanic "bomb." The bomb is a blob of magma, weighing from a few ounces to hundreds of pounds, which is launched far distances from a volcano by an explosion. When magma flows out onto the surface it is called lava. These flows average 10 feet thick and may reach speeds of 35 mph racing down the volcano's slope. There are basically three categories of lava: pahoehoe (Hawaiian for "smooth lava"), a’a (Hawaiian for "rough lava"), and the rare "pillow" lava. 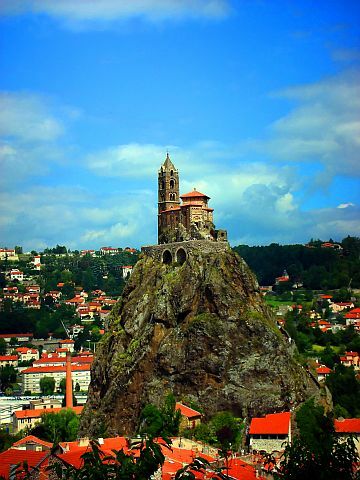 One of the more unique volcanic structures of the world, besides the famous 1,267 foot (386 m.) Devil's Tower in Wyoming, is the 279 foot (85 m.) column of lava that forms the pedestal on which sits the Chapel of St. Michel d’Aiguilhe in Le Puy, France. This steep-sided tower is thought to be the lava-filled throat of an extinct volcano that resisted the effects of erosion much better than the rest of the cone, which has long since washed away.